The middle of the summer climbing season has arrived in Pakistan and this season continues to all about weather and deaths. But also about near deaths, drones and deep snow. This story continues to unfold in mysterious ways. Ten days ago, the 2018 season was looking a lot like 2015 and 2016 with difficult weather and snow conditions that prevented anyone from summiting K2 and only a few made the other peaks throughout Pakistan. However, as is usual with weather, just when you think you have it figured out it changes and the last week was excellent for most of the teams. The forecast of heavy snow on Thursday never materialized but the snow that had already fallen did stop progress, at least on Broad Peak. 150 miles away on Nanga Parbat, some of the worlds best climbers and adventurers abandoned their efforts but a few remained and summited. With talk of winds returning, most teams have completed their acclimatization rotations and are returning to base camp to rest up for the summit push. However a few strong climbers will push hard over the next few days hoping beat the winds and nab a summit. It’s the 7th July and 5am with a reasonable weather forecast giving the team a head start with a crisp underfoot up that 40% grade wall leading to camp 1. It’s a serious approach and your pretty committed but you’re also surrounded by the most beautiful range of mountains with Broad Peak to the fore. However, just after 4 hrs of climbing, sadly, K2 took its first life, living up to its title as the Savage Mountain. A comrade mountaineer and a guy I was eating butterscotch sweets with just two days prior, tumbled passed us, falling 1000 meters to his death….I was shook to my core, looking down seeing his lifeless body below…RIP Serge. Furtenbach Adventures has their second attempt underway, “Leaving Broad Peak basecamp today [Saturday 14 July] for an other try. Conditions look promising. Hopefully we can post a summit pic here soon.” It appears there will be multiple other independent climbers and teams trying to go together including Fredrik Sträng, David Roeske, Carlos Garranzo, Jake Meyer as well as Mingma G Sherpa – who may well be the key to getting everyone to the summit this time around. Sandy and Rick are now both back at Base Camp following a couple of days making a summit attempt. Sandy returned back to camp himself after deciding to descend due to high winds. The rest of the team stayed at Camp 3 and considered their options for the summit. Rick made a summit attempt on 9th July after climbing all day and night. Rick was missing from the group and feared injured from 9th July until he was spotted by a drone, piloted by climbers at K2 Base Camp on July 10th. Sandy, with help from Andrej Berdel, his brother Bartek and their drone, was able to coordinate climbers that were already on the mountain to reach Rick at around 7.30pm. The climbers brought Rick back to camp 3 in the darkness. Rick returned to Base Camp today (12th June) safely thanks to Dan Mazur and his sherpas. After being examined by a doctor at basecamp, Rick is okay all things considered and has a few superficial cuts and some frostnip. Sandy and Rick would like to express their sincere thanks to Kacper, Stan, Andrej and Bartek Bargel, Piotr Pablus, Dan Mazur and team, Frekrik Strang, David Roeske, Major Ramzan, Captain Kaddar and Dan’s sherpas. Of course, in 2012 Sandy Allan and his climbing partner Rick Allen completed an amazing climb of the previously unclimbed Mazeno Ridge – the longest in the Himalayas – on Nanga Parbat. Adam Bielecki and Jacek Czech have made excellent progress on GII all the way to C3. Its being reported they will go for the summit on 16 July, Monday, fearing incoming weather later in the week. They will team up with Kazach Boris Dedeszko and Germany Felix Berg. Masha Gordo and Helias Millerioux, Yannick Graziani continue to acclimatize but should soon start their G1/G2 traverse unless their plans have changed. Mike Horn, Alex Gavan, Tunc Findik and Maya Sherpa all exceptional strong climber choose not to risk the dangerous conditions on NB this year. 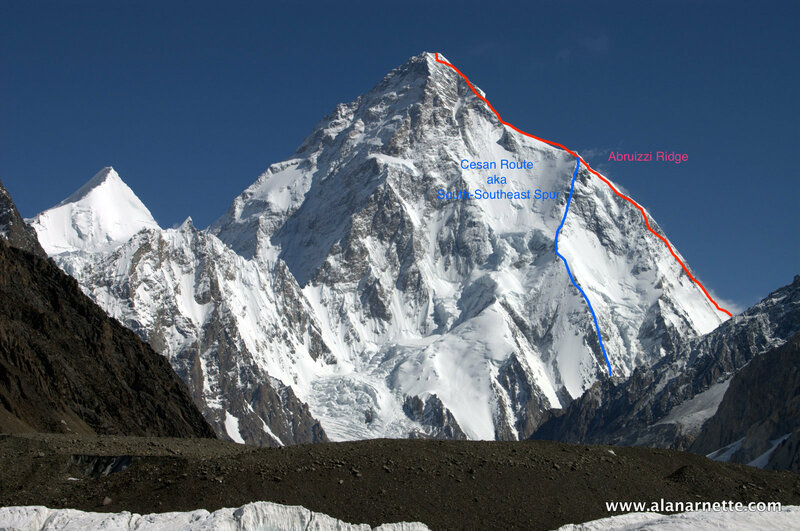 However, two climbers, both supported to some extent by Karakorum Expeditions said they summited: Niels Jespers from Belgium and Korean Kim Migon. Pemba Sherpa is missing, assumed to have fallen into a crevasse on the Saser Kangri, the highest peak at ‎7,672 m (25,171 ft) in the Saser Muztagh, the easternmost subrange of the Karakoram range, located in India. According to this report from Dream Wanderlust, he was with team of climbers led by Basanta Singha Roy from West Bengal and another team from Pune, India. While descending from the summit Pemba fell into a crevasse before reaching Camp 1 on 13th July, 2018. Other sherpas including his brother Pashang have tried to rescue him throughout the day but failed to trace him. The search will continue. Canadian Nathalie Fortin has left base camp with the body of their fallen leader Serge Dessureault “took the same plane as us to Islamabad the day after Skardu. Official papers are now signed. He is now waiting for a place on a cargo plane to join us in Quebec.” Also this past week saw the death of Italian climber Maurizio Giordano lost his life on Gasherbrum IV. His Italian military teammates reported he was hit by falling ice while on rappel. They were attempting the Bonatti-Mauri route. The third death this season was when Austrian Christian Huber had died in an avalanche on Ultar Sar. For now, we focus on GII. But from what we have seen, it seems that it would be very problematic to approach the eastern wall of the GIV, due to the large amount of snow on the so-called Italian icefall. Unfortunately, the Italian climber Maurizio Giordano died there (as a result of the serwa breaking up – news ) – this of course had a depressing effect on us. Taking this into account, it seems to me that our next goal will be GVII. Continued safe climbing to all.